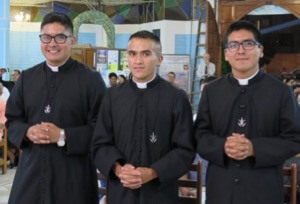 The Congregation of Holy Cross in Latin America celebrated the profession of First Vows of one religious brother and two religious seminarians in Canto Grande, Peru, on January 6, 2018. The newly professed religious are Bro. Anthony Terrones, CSC, from the Congregation’s District of Peru, Mr. Luis Antonio Ortiz, CSC, and Mr. Pedro Carreño, CSC, from the Congregation’s mission in Mexico. Two weeks after the first profession, Bro. Anthony and Assistant Novice Master Bro. John Tryon, CSC, participated in a pilgrimage and other Papal events in Trujillo, a coastal city in Peru. Pope Francis made an apostolic visit to Chile and Peru from January 15-21.